Albert (Jupp) Gardiner, carpenter and free trader, has the dubious distinction of holding the record for the longest speech ever made in the Federal Parliament—an all-night ‘stonewaller’ in 1918. Coincidentally, it was the youthful Albert’s resemblance to an English cricketer, one Henry Jupp, alias ‘Young Stonewall’, which led to his being dubbed ‘Jupp’ . Both Henry Jupp and his Australian namesake were broad-shouldered men who did not budge from entrenched positions. Albert was born on 30 July 1867 in Orange, New South Wales. He was one of twelve children. His father, William, was a wheelwright who had been born in Tasmania, and his mother Charlotte, née Davis, a native of New South Wales who had crossed the Blue Mountains in a bullock wagon. At the time of Albert’s birth, Charlotte could not write her own name. By contrast, Albert received a sound education at Flanagan’s School in Orange and at fifteen was apprenticed as a carpenter. An all-round sportsman, he played rugby for New South Wales. Having witnessed the effects of alcoholism at close quarters, he was a lifelong temperance advocate. Gardiner’s political metal was fired around the dinner table where family members took the side of either ‘protection’ or ‘free trade’, while his membership of the local Australian Workers Union (AWU) and Political Labor League led to his commitment to the Labor Party. He was an AWU organiser (1898–99) and a member of the executive of its Orange branch (1901–04). Moving to Parkes in 1890, he found employment at the Hazlehurst Mine. During the following year, he was preselected by the Labor Electoral League (a precursor of the Political Labor League) as one of the two Labor candidates for the New South Wales Legislative Assembly seat of Forbes. Topping the poll for Forbes, the twenty-three year old Gardiner was the youngest of the ‘thirty-five’ who in 1891 represented Labor for the first time in the New South Wales Parliament. Democratic reform was uppermost in his mind as he made his first speech in the Assembly in July 1891: ‘ . . . one man one vote is engraven on the hearts and minds of my constituents’. As the representative of selectors, miners and pastoralists, he spoke of the need for parliamentary intervention in the shearers’ strike, suggesting penalties for both shearers and pastoralists. On 26 January 1892, Gardiner married, at Summerhill, Ada Evelyn, née Jewell. Ada had a son, Sydney Gardiner, who was born in 1892. The child died in October 1893, and the marriage between Ada and Albert was dissolved by decree absolute in 1897. In 1894, Gardiner stood, successfully, as an Independent for Ashburnham, supporting Free Trade and Labor interests, and unsuccessfully, in 1895 and 1898, as a Free Trader. He was again unsuccessful in 1901 when he stood as an Independent for Orange. On 3 April 1902, Albert and Thresa Alice, née Clayton, were married at Parramatta. As with Albert’s first marriage, the rites were in accordance with those of the Congregational Church. The couple moved to Fiji, where Albert worked with the Colonial Sugar Refining Company. Returning to Orange, in 1904 Gardiner, despite failing to obtain AWU campaign funding, was elected to the Legislative Assembly for Orange (for the Labor Party). Gardiner’s victory speech made mention of the electoral assistance provided by the ‘well-organised band of earnest women’. But not even the women saved him at the 1907 election when, following an outspoken attack on the Premier, Joseph Carruthers, he was defeated. At the 1910 federal election, Gardiner became a senator for New South Wales. Labor was in power, and Gardiner was immediately at ease, playing the political game ‘with all the zest of the old forward’. He spoke out against compulsory military training and compulsory registration of voters.He supported the extension of the old-age pension to women of sixty. He believed ‘the individual exists for the benefit of the State’, and declared his pride in being a spokesman for the ‘honey gatherers’. Of independent mind and somewhat idiosyncratic, he avowed that Caucus allowed him to criticise the actions of his own party, and occasionally did so, as when he supported the view of some members of the Opposition ‘that a board of directors should be appointed to manage the proposed Commonwealth Bank’. During a confrontation with Senator Pearce, he accused Pearce of being ‘thin-skinned’. Gardiner was an unashamed lover of his native land. When Alfred Deakin died in 1919, he recalled events leading to Federation: ‘I remember how proud my young Australian heart was when the Australian delegates who took the Convention Bill to Great Britain left the shores of this country, because Alfred Deakin, Edmund Barton, and Charles Kingston were the men deputed to carry that measure to the Home Land’. (In 1911, he been a parliamentary delegate at the coronation of George V; probably this was his first visit to Britain.) Keen to see the establishment of a national capital, Gardiner advocated a manufacturing industry for the ‘Federal Territory’. He considered that Canberra should be a model city, ‘the property of the people of the Commonwealth’. He called for the abolition of state governors. In the fifth Parliament (1913–14), the large number of Labor senators weighed heavily on the Liberal Government’s precarious majority in the House of Representatives. Gardiner pushed Joseph Cook’s Government to amend the Government Preference Prohibition Bill: ‘Here is a Government picking out as one of the questions on which to force a double dissolution a subject more calculated to arouse the heated feelings of the people outside than any other . . .’. By May 1914, he was plaintive: ‘The Senate has met the Government more than half-way . . . It has sat at inconvenient periods, and hurried business through’. During this period, Gardiner commenced his long involvement with Senate committees, supporting the establishment of the public works committee and becoming chairman of the select committee on the general elections. 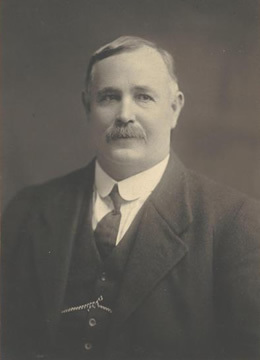 At the September election following the July 1914 double dissolution, Gardiner was elected at the top of the poll for New South Wales and became Vice-President of the Executive Council in Andrew Fisher’s Labor Government. By July1915, he was also Assistant Minister for Defence. He continued in these positions in the first Hughes Ministry. Gardiner believed that the ‘way to defend the Empire’ was by Australia keeping up its ‘end of the log’, but was unequivocal in his opposition to conscription, which, in February 1916, he predicted would ‘throw the [Labor] party back’. Nevertheless, when the Military Services Referendum Bill was before the Senate in September 1916, he voted for it. Later, he claimed that this had been an attempt ‘to hold [the Government] together’. On 27 October 1916, the day before the first conscription referendum, Gardiner discovered that an executive council regulation that allowed for a compulsory questionnaire aimed at flushing out home service draft dodgers was to be included with the referendum ballot papers. The regulation had been approved without Gardiner’s consent, or the consent of two other executive councillors—Senators Higgs and E. J. Russell. Outraged at what they considered Hughes’ unwarranted interference, the three senators resigned from the Government, but not before Gardiner used his censorship authority as acting Minister for Defence (in Pearce’s absence) to release an account of the matter to the press. The story appeared in the papers on the morning of the referendum. In the Senate, Gardiner fiercely denied that he had breached the confidence required of an executive councillor. Gardiner’s ministerial career was over. Following the Labor split in November, he became leader of the diminished Labor Party Opposition in the Senate, and deputy leader of the Caucus (1916 –26). In March 1917, he moved the appointment of a royal commission to investigate charges of bribery made against Hughes by Senator Watson. Though Gardiner remained an anti-conscriptionist, in April 1918 he represented the federal Opposition at the Governor-General’s recruitment conference, and at the 1919 ALP conference spoke against the removal of compulsory training and home service clauses in the Defence Act. As the Parliament turned again to domestic legislation, Gardiner commented wearily: ‘the various Bills claiming our attention . . . have been brought forward so rapidly that the task has proved a hopeless one’. However, he continued to be a tireless speaker. Gardiner was given to speaking often and at length, butnever was his vocal prowess better exemplified than during the debate on the Electoral Bill which led to the introduction of preferential voting for both Houses, and aided the establishment of what he referred to as ‘the Farmers’ party’. At 10.03 p.m. on 13 November 1918, Gardiner rose to protest against the Government passing all stages of the Bill before the adjournment. While senators snoozed, or slipped out for a quick snack, Gardiner read the entire Bill, including its schedule, droning on for 12 hours 40 minutes. The Bill went through, but the following year, much to Gardiner’s disgust, a new standing order limited the length of Senate speeches. But Gardiner’s loquacity, not diminished by his being the only Labor senator between 1920 and 1923, continued unabated. Nor did he become less opinionated, referring to President Givens, who once suspended him, as ‘despotic’. After the 1919 election, Gardiner became increasingly isolated as a Free Trader. In 1921, he somewhat tendentiously opposed item after item of the schedule of the Customs Tariff Bill. Not even tossing back a glass of Australian malted milk in the Senate chamber (handed to him by the Protectionist Pearce) caused him to moderate his free trade ideology. A patently decent and kindly man, he was grateful that the Parliament was ‘getting away from the hysterical legislation passed during and immediately after the war’, and supported the Aliens Registration Act Repeal Bill. He referred to the treatment of Australian Aborigines as being ‘one of the blackest pages in Australian history’. Gardiner again became a casualty of Labor Party disputation when (with Matthew Charlton and J. M. Dooley) in 1923, he accused the executive of the New South Wales branch of being ‘uncouth crooks’. He was defeated at the 1925 federal election. Now describing himself as Progressive Labour, Gardiner, at loggerheads with the policies of J. T. Lang, but with the support of the United Australia Party and ‘unofficial Labor’, was appointed in June 1928 to the Senate casual vacancy caused by the death of Senator Grant. By opposing the official Labor candidate, Arthur Rae, Gardiner was considered to be on the outside of the Party. He had been a member of Labor’s central executive (1907, 1913–16) and a delegate at Labor federal conferences (1916, 1919, 1927). In 1928, he made an unsuccessful bid—as an Independent Labor candidate—for the House of Representatives seat of Dalley, and in 1932 and 1935 was defeated as a federal Labor candidate for the New South Wales Legislative Assembly seats of Waverley and Canterbury respectively. It was a sad ending to his long years of devotion to the Labor Party. When he died on 14 August 1952 at his home at Bondi Junction, there were few of his old colleagues left in the Senate. In his time, Gardiner had given many generous valedictories for senators on both sides of the chamber. Now he was accorded a state funeral at which Sir Earle Page represented the Prime Minister, R. G. Menzies. After a service at St Barnabas Church of England, Waverley, the cortege moved to the Northern Suburbs Crematorium. Gardiner’s wife, his son Harold and daughter Lilly survived him. Gardiner was not as politically astute as his friend and sparring partner, George Pearce, but he remained true to his beliefs and principles. He was a large man with a large spirit. Conversation between the author and Gardiner’s great-niece, Carol Grout-Smith, Canberra, January 1999; Punch (Melbourne), 22 August 1912, p. 296; Leader (Orange and Millthorpe), 9 August 1904, p. 2; Daily Telegraph (Sydney), 10 August 1904, p. 6; Christopher Martin-Jenkins, The Complete Who’s Who of Test Cricketers, Rigby, Adelaide, 1980, p. 77; Ross McMullin, Light on the Hill: The Australian Labor Party 1891–1991, OUP, South Melbourne, Vic., 1991, p. 13; Mark Lyons, ‘Gardiner, Albert’, ADB, vol. 8. AWU Records, N117/1483, Butlin Archives, ANU; Leader (Orange and Millthorpe), 9 August 1904, p. 2; Daily Telegraph (Sydney), 17 July 1894, p. 5, 10 August 1904, p. 6; Bede Nairn, Civilising Capitalism: The Beginnings of the Australian Labor Party, MUP, Carlton, Vic., 1989, pp. 67–71. NSWPD, 22 July 1891, pp. 285–286, 6 August 1891, p. 738, 28 February 1893, pp. 4672–4673; AWU Records; Leader (Orange and Millthorpe), 9 August 1904, p. 2; NSWPD, 5 July 1907, pp. 192–225; Daily Telegraph (Sydney), 9 July 1907, p. 5; Leader (Orange and Millthorpe), 20 August 1907, p. 2. Punch (Melbourne), 22 August 1912, p. 296; CPD, 7 December 1911, p. 3866, 2 November 1911, p. 2135, 4 August 1910, pp. 1075–1076, 10 August 1910, p. 1321, 3 November 1910, p. 5596. CPD, 19 June 1912, pp. 11–12, 14 December 1911, p. 4469, 8 November 1910, p. 5727. CPD, 8 October 1919, p. 13051, 22 August 1912, p. 2539, 19 October 1911, p. 1614, 12 October 1921, p. 11857, 6 November 1912, p. 5072. CPD, 10 December 1913, p. 3992, 6 May 1914, p. 606, 18 December 1913, p. 4689; Senate, Journals, 16 December 1913. Argus (Melbourne), 18 September 1914, p. 6; CPD, 3 November 1910, p. 5595, McMullin, The Light on the Hill, p. 103; Letter, Gardiner to Andrew Fisher, 14 February 1916, Fisher Papers, MS 2919/1/195, NLA; CPD, 14 March 1917, pp. 11339–11340. Gavin Souter, Acts of Parliament, MUP, Carlton, Vic., 1988, p. 149; Geoffrey Sawer, Australian Federal Politics and Law, 1901–1929, MUP, Carlton, Vic., 1956, pp. 132–133; Argus (Melbourne), 28 October 1916, p. 16; CPD, 1 December 1916, pp. 9338–9348. CPD, 29 November 1916, p. 9236, 13 March 1917, pp. 11213–11214, 11268; Ernest Scott, Australia During the War, A & R, Sydney, 1943, pp. 448–449; ALP, Report of proceedings of the special Commonwealth conference on conscription, Melbourne, Dec. 1916; ‘Labor Call (Melbourne), 1917, pp. 5, 16; ALP, Official report of the 8th Commonwealth conference . . . Hobart, 1919, p. 73; CPD, 23 October 1919, p. 13844. Souter, Acts of Parliament, pp. 165–166; CPD, 5 August 1920, p. 3273, 13 November 1918, pp. 7682–7762; Argus (Melbourne), 15 November 1918, p. 6; Age (Melbourne), 15 November 1918, p. 8; G. S. Reid and Martyn Forrest, Australia’s Commonwealth Parliament 1901–1988, MUP, Carlton, Vic., 1989, pp. 170–171; CPD, 5 December 1918, pp. 8801–8803, 15 August 1919, pp. 11587–11589, 1 December 1921, p. 13468; SMH, 17 May 1918, p. 8; Sun News-Pictorial (Melbourne), 15 August 1924, p. 3. Sawer, Australian Federal Politics and Law, p. 188; CPD, 13 July 1921, p. 9948, 9 August 1921, p. 10802; Argus (Melbourne), 10 August 1921, p. 8; CPD, 16 August 1923, p. 2845, 28 June 1923, p. 445. Patrick Weller and Beverley Lloyd, Federal Executive Minutes 1915–1955: Minutes of the Meetings of the Federal Executive of the Australian Labor Party, MUP, Carlton, Vic., 1978, p. 65; Argus (Melbourne), 7 June 1926, p. 10,6 June 1928, p. 22;Lyons, ‘Gardiner, Albert’, ADB; SMH, 15 August 1952, p. 3; CPD, 25 June 1926, pp. 3541–3543; SMH, 9 October 1928, p. 12, 10 October 1928, p. 14, George Foster Pearce, Carpenter to Cabinet: Thirty-Seven Years of Parliament, Hutchinson & Co., London, 1951, pp. 129–130; Letter, Gardiner to Pearce, 28 June 1938, Pearce Papers, MS 1927/3/951, NLA; SMH, 17 August 1952, p. 5. This biography was first published in The Biographical Dictionary of the Australian Senate, vol. 1, 1901-1929, Melbourne University Press, Carlton South, Vic., 2000, pp. 45-49.